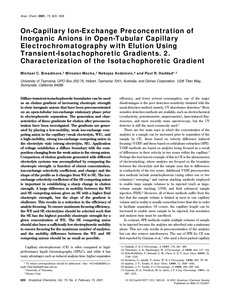 Diffuse transient-isotachophoretic boundaries can be used as an elution gradient of increasing eluotropic strength to elute inorganic anions that have been preconcentrated on an open-tubular ion-exchange stationary phase prior to electrophoretic separation. The generation and characteristics of these gradients for elution after preconcentration have been investigated. The gradients are generated by placing a low-mobility, weak ion-exchange competing anion in the capillary (weak electrolyte, WE), and a high-mobility, strong ion-exchange competing anion in the electrolyte vials (strong electrolyte, SE). Application of voltage establishes a diffuse boundary with the composition changing from the weak anion to the strong anion. Comparison of elution gradients generated with different electrolyte systems was accomplished by comparing the eluotropic strength (a function of eluent concentration, ion-exchange selectivity coefficient, and charge) and the shape of the profile as it changes from WE to SE. The ion-exchange selectivity coefficient of the SE competing anion is important in establishing a sharp change in elution strength. A large difference in mobility between the WE and SE competing anions gives an SE with a higher final eluotropic strength, but the slope of the gradient is shallower. This results in a reduction in the efficiency of analyte focusing. To ensure maximum focusing efficiency, the WE and SE electrolytes should be selected such that the SE has the highest possible eluotropic strength for a given concentration of WE. The SE competing anion should also have a sufficiently low electrophoretic mobility to ensure focusing for the maximum number of analytes, and the mobility difference between the WE and SE competing anions should be as small as possible.